Gardens are places you can go to eat, relax, and get back to a simpler mindset, but they can also be extremely deadly. When we walk in a garden, we rarely think about how plants can kill us, and some of them can drop us in a matter of minutes. So next time you are in the garden, remember these plants you see here, because chances are, they are in someone’s garden, and the last thing you want to do is test your resolve against them. The first on our list is one of the most well know killers in the plant world. 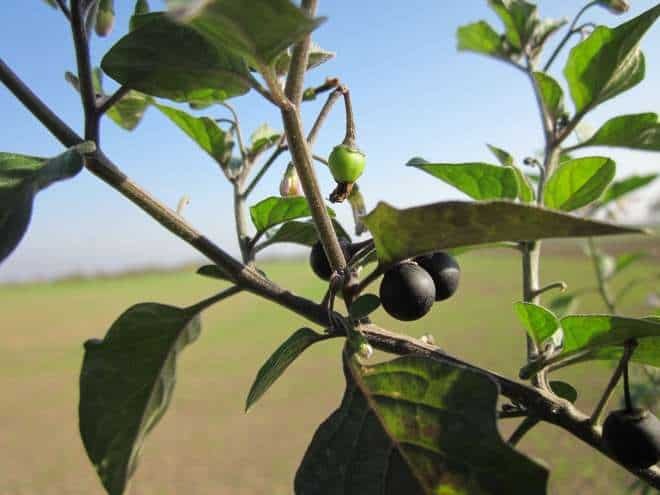 Also called duscle, garden huckleberry, hound’s berry, petty morel, or simply nightshade, there are many varieties, and most are extremely poisonous. The entire plant is poisonous, but the berries, in particular, are what people – especially children – tend to eat. The poison, solanine, can take anywhere between 6-12 hours for the symptoms to appear, and those include abdominal pain, diarrhea, and vomiting. Fatal doses include fever, sweating, confusion, drowsiness, cardiac arrhythmias and respiratory failure. The plant is identified by its broad leaves and black ripe berries. It’s important to remember that the berries may be different colors, and other varieties of the plant are used in culinary and can look identical to their fatal cousin. The oleander is world renowned for its blooms that seem to go on all year round. This is one of the most toxic plants that we regularly find in gardens. From home gardens to massive landscaped courtyards, their cultivation is worldwide. The entire plant is poisonous, especially the leaves and flowers. The toxic compound in oleander, oleandrin, can cause vomiting, diarrhea, and abdominal pain, with fatal doses attacking the nervous system tremors, seizures and finally coma and death. Although very few fatal cases have been reported, one, in particular, gives a good lesson to learn vicariously from. A woman died from a cup of infused Oleander tea. So even though it smells wonderful, you better think twice before infusing that lovely fragrance into a tea. Oleanders are easily identified by their leaves and blooms; which range from white to various shades of pink, red, and even purple. 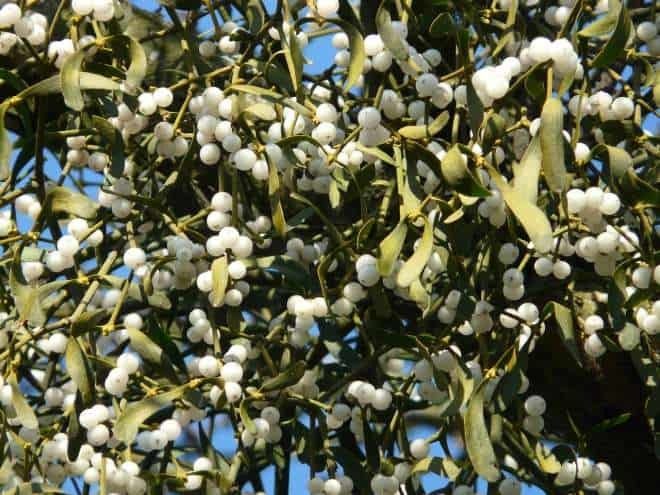 In the wild, the mistletoe is a parasite, living off of its host tree. They are easily identified by their white berries. The entire plant is poisonous, but like most plants, the toxins are found concentrated in the berries. Although fatal doses are rare, you are sure to have a bad time with all the abdominal pain, diarrhea, and vomiting that ingesting small amounts will do to you. Another popular plant that comes out during the holiday season, the poinsettia, or what my mom always called, “Don’t touch that!” Because of its beauty and abundance in the household during the holidays, this plants toxicity has been well documented. From whole parties getting sick from Poinsettia tea to the family dog dying from accidental poisoning from eating the plant, there are many misconceptions about how poisonous it is. 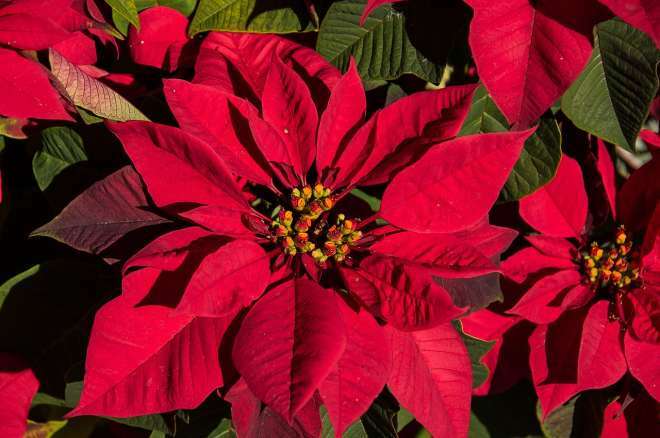 There have been many studies regarding the toxicology of the Poinsettia, and the definitive answer is that it isn’t as poisonous as we thought. Obviously, children and the elderly are more susceptible, but even then, they have to ingest a completely ridiculous amount for it to be fatal unless it’s an allergic reaction. The sap is toxic, and generally, the allergic reaction to the plant is due to the latex coating on the leaves. Bright red mature leaves make the poinsettia easily identifiable. The Castor Beans is world renowned for making castor oil, a cure-all oil used for many purposes, but a sinister compound resides within the bean that can kill you almost immediately in heavy doses. 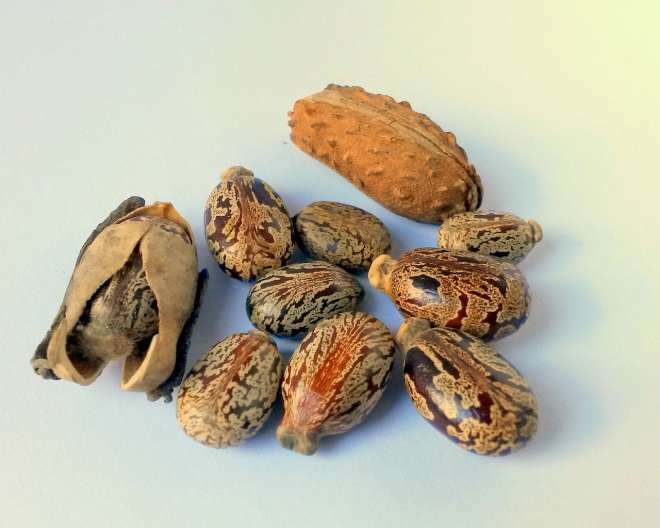 Castor beans are not a bean at all, and in fact, the bean is the seed of the plant which is where they get the oil from, and where the toxin, ricin, can be found. The ricin compound can be found all over the plant but is concentrated in the seeds. An adult eating just 4 of these seeds can cause poisoning; including nausea, vomiting, abdominal pain, and diarrhea. Although seizures can happen with high doses, most people suffer from severe dehydration due to the ‘purging’ process the body goes through. Castor Beans are identified by their multicolored leaves and seeds that look almost like watermelon seeds. 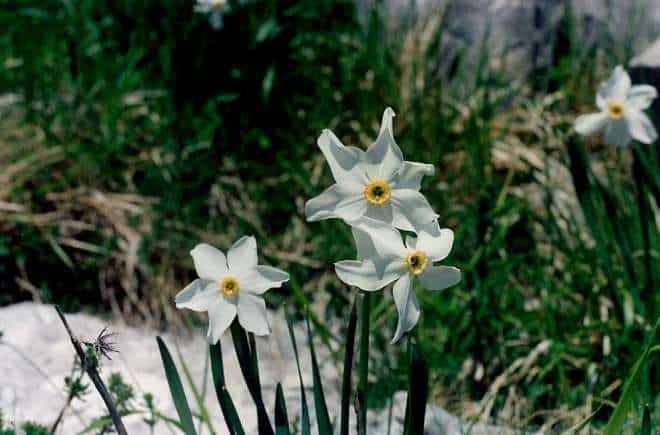 Poet’s Narcissus is known for its beauty, fragrance, and toxicity in confined spaces. Dating back to antiquity, the flower has been used for centuries and has the tales to prove it. One tale from the Greeks has Persephone and her companions picking them before Hades takes her to the Underworld, and that is why to this day it is still used to decorate tombstones. Used primarily for its fragrance for perfumes, it is this reason people put it in their homes and end up getting sick from it. The strong odor can induce headaches and vomiting, and ingesting the plant can cause abdominal pains and vomiting as well. 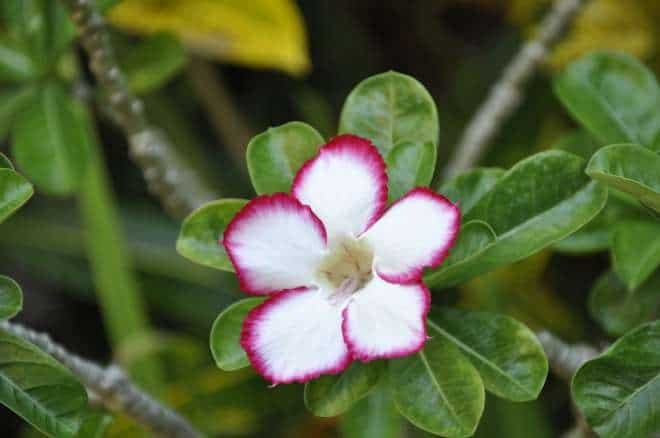 The flower is identified by the white flower with six petals in a star formation and its bright yellow center. Water Hemlock; also know as cicuta, cowsbane (because they eat the roots after a plowed field), poison parsnip, or just simply as Hemlock, is an extremely poisonous plant found in the temperate climates all over North America and Europe. Cicutoxin, the toxic compound and found all over the plant, attacks the central nervous system inducing seizures, hallucinations, delirium, coma, and respiratory failure. Death usually occurs due to the respiratory failure and symptoms can occur within 15 minutes of ingestion. 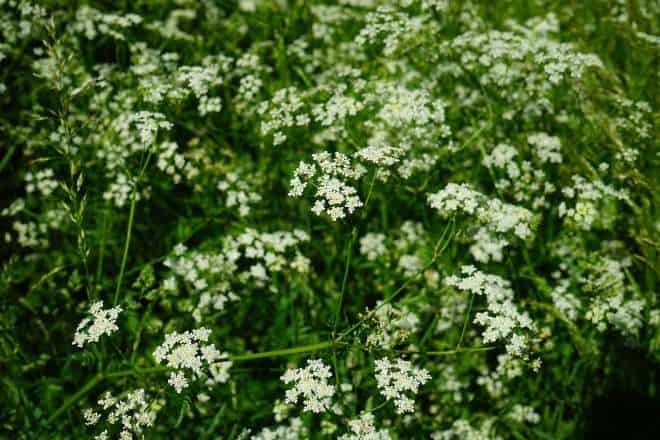 Water Hemlock is identified by its long stems, thin leaves, and a bouquet of small white flowers. The English Yew is native to most of Europe, Northern Africa, and parts of Asia and is grown in gardens for its beautiful red berries. All but the berries are toxic on this tree, although the seeds in those berries are toxic as well. Even the pollen from the male tree is toxic, inducing headaches, rashes, aching joints, and asthma reactions. Taxine is the compound that causes poisoning, and the symptoms include convulsions, muscle tremors, difficulty breathing, accelerated heart rate, and cardiac arrest. You could also show no symptoms and drop dead within hours. 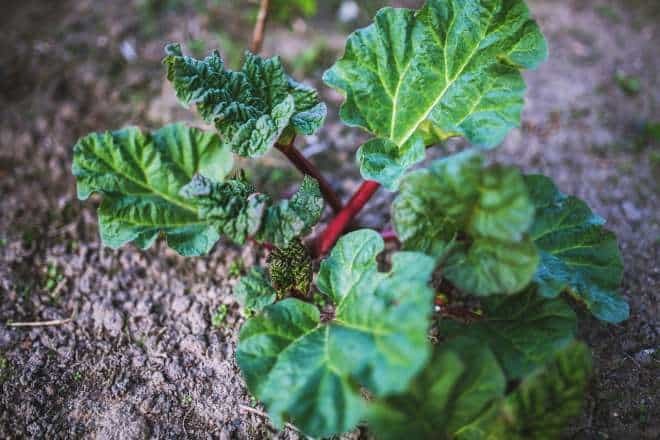 Rhubarb is an extremely popular plant in the food garden(I am growing some at the time of this writing. ), but what a lot of people don’t know is that it is actually poisonous. Anyone that grows it regularly knows this, but a lot of people not familiar with the plant will assume those broad, vibrant green leaves are poisonous. 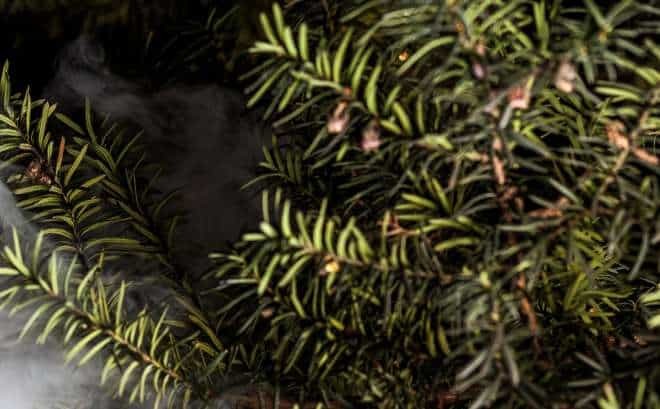 Oxalic acid is found in the leaves, and although you would have to eat A LOT of bitter leaves to equal a lethal dose, you are best staying away from the leaves and eating the stalks like everyone else. Symptoms include diarrhea, nausea, vomiting, coma, seizures, kidney stones, difficulty breathing, and other problems with your respiratory system. Rhubarb is identified easily by its long reddish stalks and broad green leaves. The Mountain Laurel is cultivated for its ground covering capabilities and lovely flowers, which cultivators have now grow to darker pinks and hues of red as opposed to it’s traditional white or soft pink colors. The entire plant is poisonous(including the pollen) to us and most farm animals. The grayanotoxin and arbutin causes erratic breathing, profuse salivation, vomiting, diarrhea, coma, and death. Even the honey produced from these flowers is toxic! The Mountain Laurel is identified by its evergreen leaves and distinct umbrella-shaped flowers. 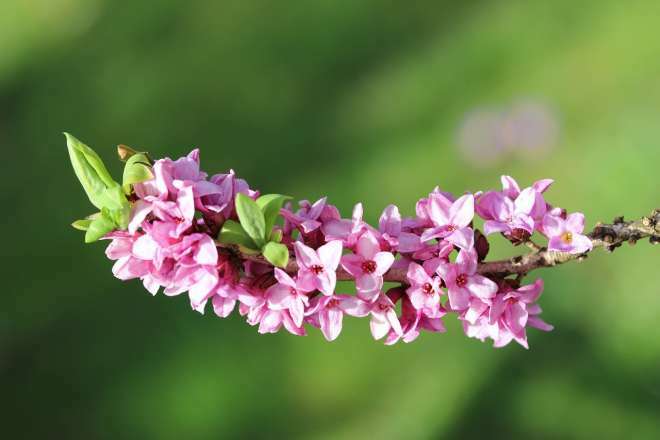 Daphne, in all of its forms, has been grown for a long time for its flowers and fragrance. One thing it isn’t being grown for though is its berries, which are highly toxic. The flowers can range from a greenish yellow to vibrant reds and purples, but they always form in clusters at the end of the stems. The poisonous berries can be fleshy or dry and leathery. Symptoms include abdominal pain, vomiting, diarrhea, burning of the mouth and intestinal tract, and in severe cases coma and death. Daphne is easily identified by its long stems filled with little flowers and berries. 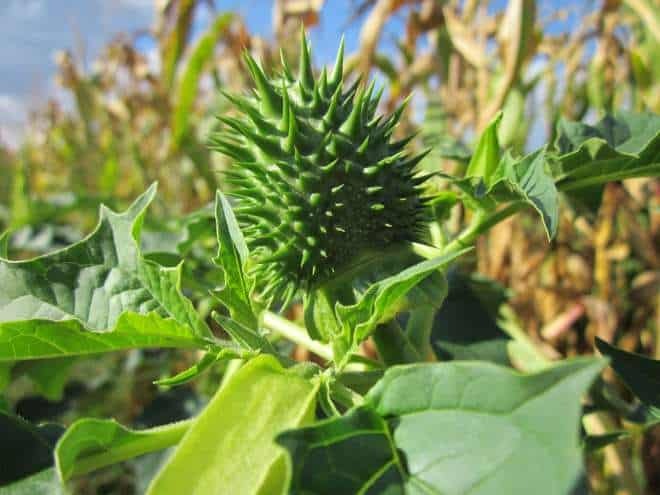 Jimson Weed is also known as Angel’s Trumpet, Stinkweed, Locoweed, and my favorite, Devil’s Trumpet. Found in most of the United States now, the trumpet in the name comes from the trumpet-shaped flowers that this plant produces. Due to the hallucinogenic effects, it is taken for recreational use that almost always ends badly. The hallucinations are due to the lethal amounts of hyoscyamine and scopolamine which causes them and other symptoms including delirium, hyperthermia, and painful mydriasis(dilation of the pupils). As stated before, Jimson Weed is identified by its trumpet-shaped flowers. And like the Mountain Laurel, honey produced from these plants has proven to be toxic for consumption, and there are even accounts of Greek soldiers dying from honey produced from these plants. Symptoms include vomiting, diarrhea, abdominal pain, coma, and death. 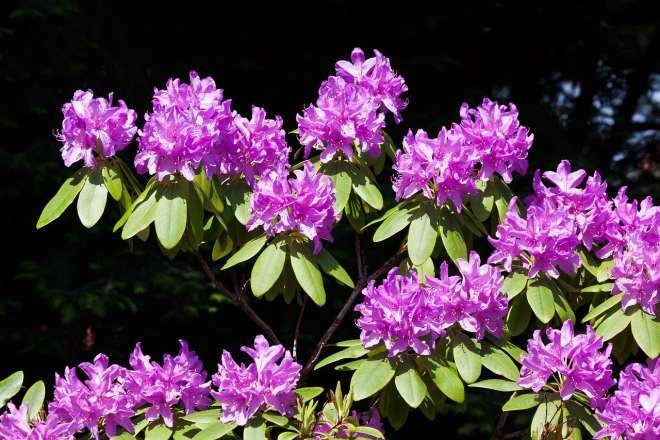 Rhododendrons are identified by their thin evergreen leaves and vibrant flowers ranging from white to bright reds, purples, and pinks. 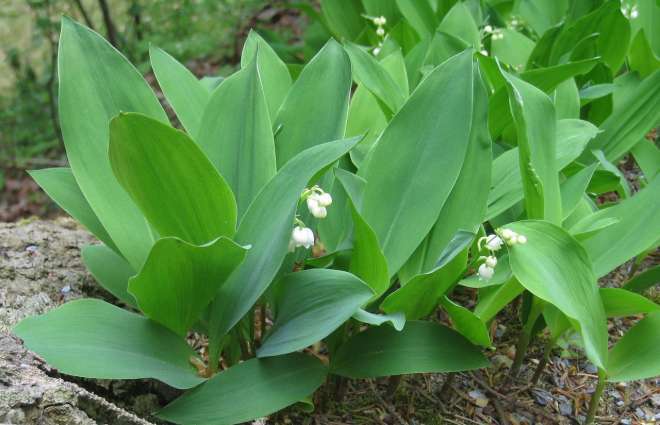 Like most on this list, Lily of the Valley is grown for its sweet scent and beautiful flowers, and like all the plants on this list, very toxic and very dangerous. Native to the Northern Hemisphere, you can find this plant in a lot of gardens today. Around 38 compounds have been identified to cause cardiac issues just in this plant alone. The entire plant is toxic, and symptoms include reduced heart rate, blurred vision, skin rash, and drowsiness. One of the most easily identifiable plants on this list, the white flowers hang off the stem to form a bell. A lot of gardeners don’t feel like their garden is complete without a few Hydrangeas in there. They add a lot of color to the garden, and they are very easy to take care of – Hence so many people growing them. One fact that is usually not said to you when you buy these from a nursery is how poisonous they are. The entire plant is filled with hydragin, which acts very similar to cyanide. It’s concentrated more so in the buds and flowers, and symptoms include, respiratory failure, dizziness, low blood pressure, fainting, convulsions, and death. 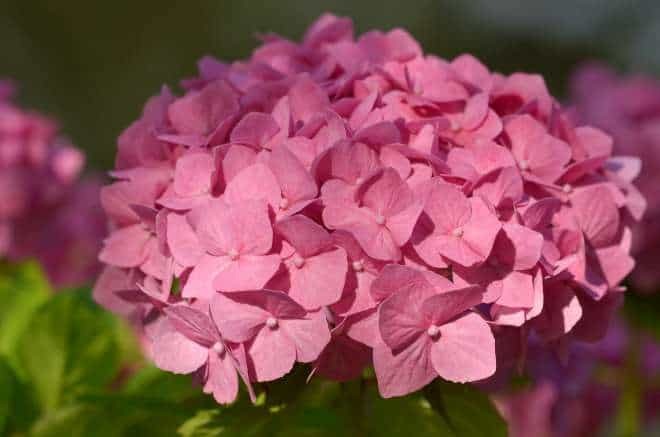 You can identify Hydrangeas by the bouquets of white, blue, purple, pink or even red flowers. Foxgloves are another ornamental plant on this list grown for its beautiful flowers and is also know as Dead Man’s Bells and Witch’s Gloves. The scientific name Digitalis comes from finger-like, as the flower resembles a cover that could easily slide on and cover one’s finger. It was once believed that Foxglove could treat seizures, and it’s believed that Van Gogh’s painting “Yellow Period” was influenced by this treatment as prolonged exposure cause jaundice or yellowing of the skin. Symptoms include nausea, vomiting, diarrhea, blurred vision, abnormal heart rate, tremors, seizures, and death. 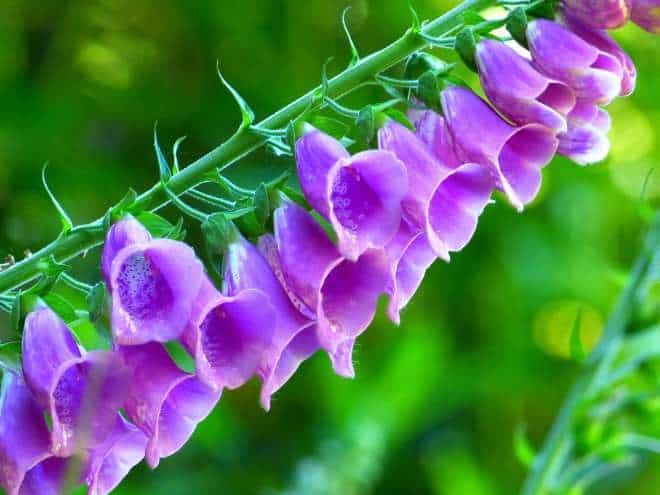 You can identify foxglove by its vibrant pink-purple bell-shaped flowers. No office space is complete without one of these sitting in a corner. Or at least that’s what I have learned from limited experience in them. 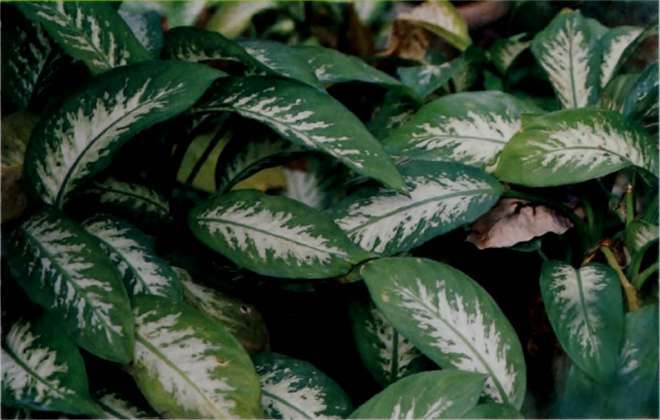 Dumb Cane, also called by its scientific name Dieffenbachia, is a hearty plant that can thrive on very little sunlight, making it perfect for indoors. Although not considered deadly, the fact that this plant is usually within arms reach of children, or ground level for an animal, raises some alarm bells. The raphides, needle-shaped crystals on the plant, cause severe irritation. Symptoms include numbing, drooling and swelling. You can identify this one by its distinct leaves that are striped and spotted. 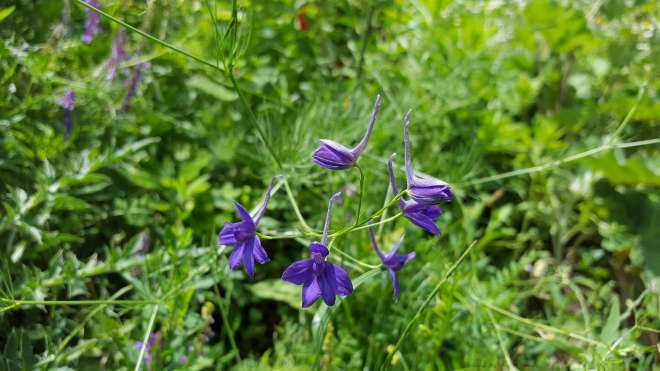 Larkspurs grow wild in the United States and cattle ranchers actually wait till the plant is less toxic before they move their cattle to that field. That tells you something immediately about this plant. They are grown for the amazing amount of flowers and color they provide, but with that comes a cost. The entire plant is poisonous, especially new growth and the seeds. It’s important to take the necessary precautions when dealing with this plant because even a little bit in your system could be fatal. Death can occur within a few hours of digestion and symptoms include nausea, vomiting, burning of the mouth and esophagus, slowing of the heartbeat, and finally, death. The flower is quite distinct in that it has a few ‘sharp’ petals that tend to be vivid and bright in color. So whether you are planning on planting some of these popular plants in your garden, enjoying a stroll through a friend’s garden, or foraging out in the wilderness, it’s important to know these plants and what to do when you come across them. It could mean life or death, or save a few hours of spilling your lunch everywhere. Very good overall. I think it would be prudent, however, to revisit the photograph used for Mountain Laurel. 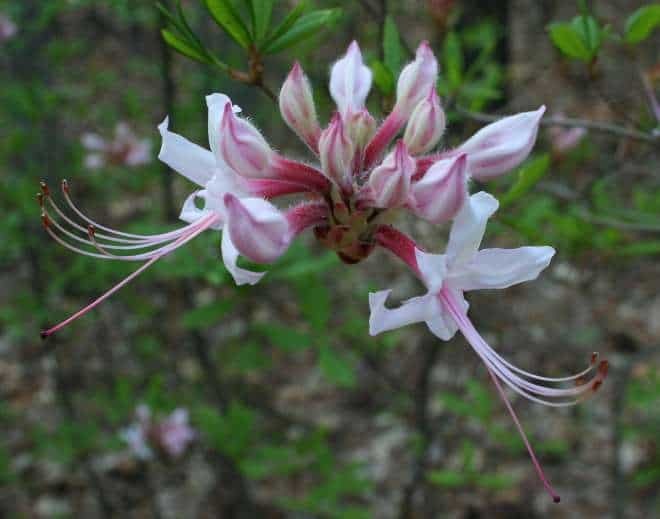 I believe that a photo of Wild Azalea has been improperly labeled.